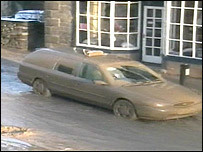 Water and slurry flooded into buildings and homes in a North Derbyshire village when a lagoon at a quarry burst its banks. Fire officers were called to Stoney Middleton after reports of flooding in buildings and offices early on Monday. It is believed a lagoon at Glebe Mines was involved, causing a wall of water to flood the village. About 30 homes were damaged and the local school is expected to remain closed on Tuesday. The A623 was also closed due to the flooding. Heather Waugh, landlady of the Moon Inn, said it was devastating for people in the village. She said: "I just looked out of the window and it was like a load of sludge coming down and then suddenly a full-blown river just flooding down the middle of the village. "It got to about 2.5ft high, just kept coming and coming and coming. It's gone into people's houses and flooded them, there's mud everywhere and it's horrible. "People are devastated of course, trying to get into their houses and see what damage has been done."